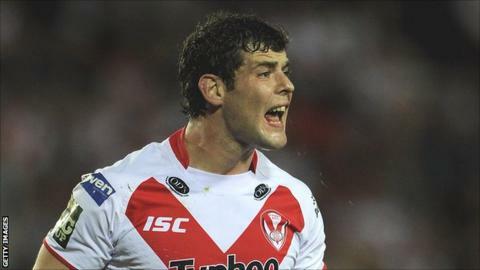 Paul Wellens says St Helens must make the most of their try-scoring opportunities if they are to reach a seventh consecutive Grand Final. He told BBC Radio Merseyside: "In the play-offs, there are fewer chances so you have to be clinical. "It's something we'll work on and it's something we feel confident we can achieve. I think we made some really positive strides against London." Saints, currently third, should finish the regular season inside the top four. They are two points clear of fifth-placed Leeds, with a vastly superior points difference to the Rhinos. It means Saints could be just two victories away from maintaining their record of appearing in every Grand Final since 2006. Meanwhile, Wellens' brace of tries against the Broncos means he needs just two more to move up to sixth in the club's all-time try-scoring list, above former team-mate Anthony Sullivan. "It came as a surprise when I saw where I was," said Wellens. "I had the pleasure of playing with 'Sully' and I think he's one of the finest finishers to have played the game. To be amongst that type of company is fantastic."